One obstacle to developing this kind of "glucose-responsive insulin" is that it is difficult to know how these drugs will behave without testing them in animals. MIT researchers have now created a computer model that should streamline the development process: Their new model can predict how glucose-responsive insulin (GRI) will affect patients' blood sugar, based on chemical traits such as how quickly the GRI becomes activated in the presence of glucose. 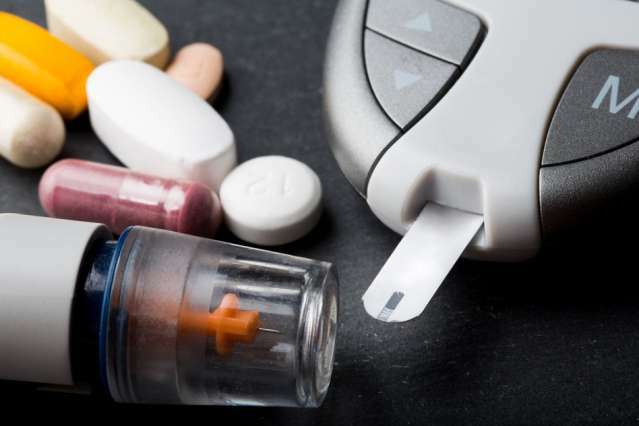 "The concept of GRI has been a longstanding goal of the diabetes field," says Michael Strano, the Carbon P. Dubbs Professor of Chemical Engineering at MIT. "If done correctly, you could make it so that diabetics could take an occasional dose and never have to worry about their blood sugar." Other GRI approaches that scientists have tried involve insulin embedded into hydrogels that release the drug when they encounter glucose, and insulin-carrying particles made from polymers that degrade when they bind to glucose. In all of these cases, it's important to know how strongly the glucose will interact with the GRI and how quickly the insulin will begin acting. "We started by thinking about the GRI as a set of equations," Strano says. "The result is the first rational design for the GRI." The researchers incorporated the American Diabetes Association's recommended blood sugar limits into their model, allowing them to determine which GRI parameters produce blood sugar control within the suggested guidelines. The paper shows that it is possible to optimize the design of chemically modified insulin, says Frank Doyle, the dean of Harvard University's John A. Paulson School of Engineering and Applied Sciences. "Furthermore, they demonstrate effective (simulated) control for three meals in a 24-hour period, as well as a missed meal scenario. Taken together, these results reveal the exciting promise of such a strategy for diabetes treatment, along with the opportunity for human clinical evaluation," says Doyle, who was not involved in the study. "We could envision a future where that's the norm for all therapeutics: We could ask our drugs to modulate their potency based on our immediate, instantaneous need in real time," Strano says. "That's pie-in-the-sky at this point, but the starting point of this concept is a model for their design." More information: Naveed A. Bakh et al. Glucose-responsive insulin by molecular and physical design, Nature Chemistry (2017). DOI: 10.1038/nchem.2857 Naveed A. Bakh et al.